A preview of the new Hyster® Tracker Wireless Access Monitoring System will take place on the Hyster stand at BAUMA 2013, from 15-21 April at the Messe München in Munich, Germany. Hyster-Tracker-ChecklistThe latest fleet management offering from Hyster is designed to enhance productivity by monitoring and reporting on the performance and use of forklift trucks in operation. The Hyster® Tracker will be officially launched in the summer of 2013, but can be seen for the first time in Europe on the Hyster stand at BAUMA. The system can be used to track key performance data and, through wireless tracking technology, materials handling operations can keep tough Hyster® forklift trucks running for even longer and even more productively. The Hyster® Tracker monitors the materials handling fleet, controls operator access and helps to verify that the operator pre-shift checklist has been completed before operation. Some of the key benefits include asset protection, cost management and reduced downtime control, as well as cost tracking wirelessly through the HysterTracker.com portal, which can be accessed using a desktop, laptop or tablet. “The new Hyster® fleet management system provides valuable information to operation managers about the operation of and maintenance for Hyster® forklift trucks, enhancing productivity through intelligence” explains Francois Serfontein, Vice President Aftermarket EMEA. Hyster Tracker Graph TelemetryThe Hyster® Tracker system provides three different levels of monitoring and different functionality including wireless monitoring, wireless access and wireless verifications. Materials handling operations can use various tracking capabilities offered by the Hyster® Tracker, such as hour meter, cost of operation, periodic maintenance, fault code tracking, impact sensing and operator training. 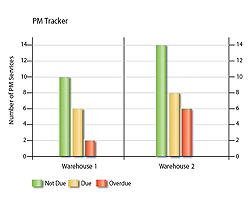 Thorough monitoring helps operations to effectively manage their forklift truck fleets and operators, driving higher levels of productivity and efficiency. When an impact occurs, for example, emails are sent out automatically, making it easier to review incidents and related product damage. The wireless access offering enables remote lift truck monitoring, idle shutdown and operator access control. Hyster Tracker Impact GraphTo prevent operators from leaving running equipment unattended, an idle shutdown feature powers off the equipment following a pre-identified amount of time if the equipment is tracked as idling or unattended. This also helps to reduce excess fuel costs. The wireless verification functionality uses checklist tracking enabling an on-board, prompt-based verification of equipment issues, allowing them to be addressed and resolved as quickly as possible, reducing expenses and potential downtime. Hyster® Tracker can also be linked to existing WIFI resources. The Hyster® Tracker Wireless Access Monitoring System will be available later in the year in Europe, the Middle East and Africa. For more information about Hyster® Tracker and the full range of Hyster® materials handling equipment available to suit the most demanding operations, please visit the new Hyster global website at www.hyster.eu. As space becomes an increasingly bigger problem for some industrial companies, careful forklift truck selection can provide valuable breathing space to help maintain an efficient and productive operation. 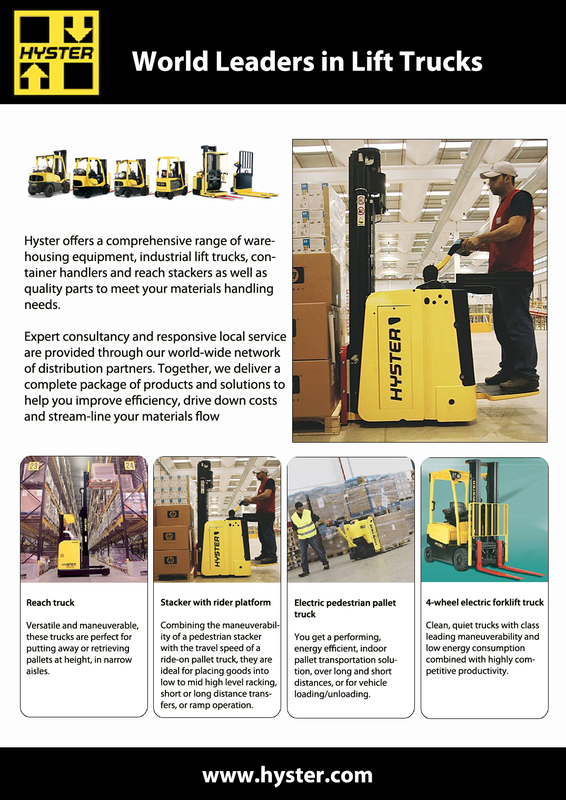 Forklift truck manufacturer Hyster can help companies gain more space through more compact and manoeuvrable, high capacity trucks. Space is a luxury for many industrial companies particularly in areas where there is a high density of population and high land and rental costs. Business growth, seasonal expansion or inadequately managed facilities may put pressure on a business and contribute to an increasing lack of space. However, relocating the business to bigger premises is usually a last resort leading companies to address space problems at their existing premises. “The productivity of handling operations is reduced if space is limited and unsuitable forklift trucks have been specified. Space is therefore a major consideration in the design of all Hyster forklift trucks, but it is not just indoors where space is an issue, it can apply to all varieties of application.” explains Peter Madoc-Jones, Hyster Product Marketing Manager. Timber yards or building materials production sites are prime examples where high capacity lift trucks are needed but where space may be an issue. In general, carelessly driven forklift trucks can cause damage to stock, but in operations where space is limited, companies will see significantly high levels of product damage unless appropriate equipment is specified. Drivers will also need to perform operations more carefully, increasing the time needed to carry out tasks, unnecessarily increasing the hours on the clock. “In most cases it is not possible to plan a site any differently and the only way to increase space is through selecting a more compact truck that manoeuvres excellently but still offers the lift capacity needed.” The Hyster Fortens range of diesel and LPG forklift trucks is available with an S-series option up to 7 Tonnes lifting capacity. Users can gain a high lift capacity truck with a more compact frame with reduced width and length and shorter wheel-base. For example, a standard 2.5 Tonne S-series is available on a similar chassis to the 1.8 Tonne model delivering superior ergonomics, low lifetime costs, dependability and excellent manoeuvrability. In ‘bigger’ applications where lift requirements exceed 7 Tonnes, space is still an important factor. Hyster’s ‘Big trucks’ span up to 48 Tonnes which include some of the smallest chassis designs in their class and offer dependable performance for applications such as metal works, foundries or ports. Launched in 2007, Hyster’s short wheel base 18 Tonne truck, H18.00XM(S)-12, has a wheel-base of only 3.5m but provides outstanding performance and power for the toughest applications. Likewise at 48 Tonnes, Hyster’s H36.00XM(S)-12 is the most compact in its class with a wheelbase of only 5.38m. 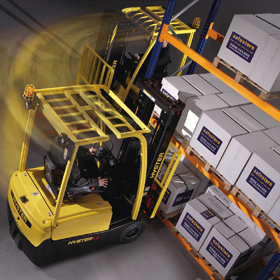 “Visibility is also crucial to help drivers manoeuvre forklift trucks efficiently where space is limited. Hyster’s ‘Vista’ cab is designed to provide excellent all round visibility and is featured across the ‘big truck’ range, delivering excellent sight of the fork-tips or rearward vision over sloping counterweights.” explains Peter Madoc-Jones. Indoors where space can be extremely tight in warehouse aisles or loading bays, LPG and electric forklift trucks are usually specified. The S-series version of the Fortens provides significant benefits to industries such as the paper industry that require the high lift capacity offered by a ‘clean’ LPG truck with compact dimensions for efficient manoeuvering. Electric trucks are typically specified for lighter lift applications either to service the production lines, load lorries or operate in racking for storage requirements. Hyster’s electric trucks offer some of the most compact chassis designs assisted by superior steering capabilities and visibility. Robert O’Donoghue, General Manager for Hyster Warehouse Products explains “Compact dimensions are not the only way to improve manoeuvrability in tight spaces. The steering and visibility is essential and it is the combination of all these factors where Hyster products excel.” In fact, in 2008, a series of comparative tests were carried out in a realistic, intensive application environment against competitor products. The tests not only showed that the new J1.5XN-2.0XNT 3-wheel and J1.6-2.0XN 4-wheel electric models have compact dimensions, but also that they offer the tightest turning circle of any trucks in their class, exceeding the performance of their closest competitors.